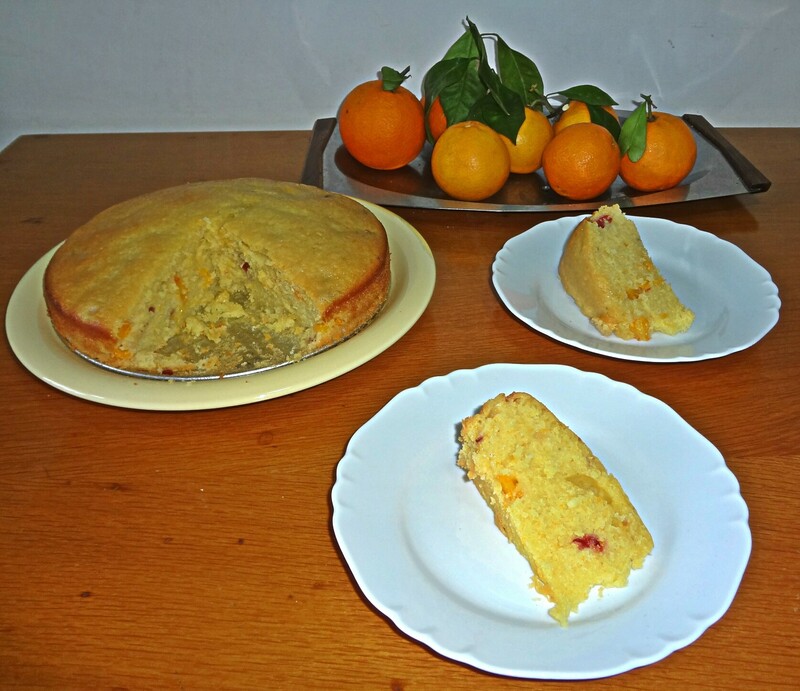 Last week while doing a Google search on Tarocco oranges, I stumbled upon a recipe for Blood orange olive oil cake. Just reading it made my mouth water so I decided to give it a shot. The kitchen in our rented apartment is very sparse so first I had to buy cake tins. Luckily, our Chinese owned local ‘Dollar’ store has all manner of cheap stuff and I found a set of 3 springform pans for Eur 7.50. The ingredients which were basically flour, oranges, sugar, eggs and olive oil we had at home but baking powder was more of a problem as I didn’t know what it was called in Italian. Despite being a good cook, Fidz was no help as he doesn’t do sweets or cakes. After perusing the supermarket shelves at length, I finally came upon something called ‘Agente Lievitante’. Obvious, you might think but there were different types, for breads, for certain types of cakes, for some desserts, some with vanilla. Reading the ingredients was not much help as I had no idea what baking powder consists of anyway. I bought what seemed the most appropriate and came home to consult the Google oracle again. Did you know that baking powder contains a weak base, usually bicarbonate of soda, a weak acid like tartaric acid (cream of tartar) and corn starch as a stabilising agent? The Italian baking powder does not contain cream of tartar but another acidic agent so knowing about tartarate in advance would have confused me even further. But I digress…………. 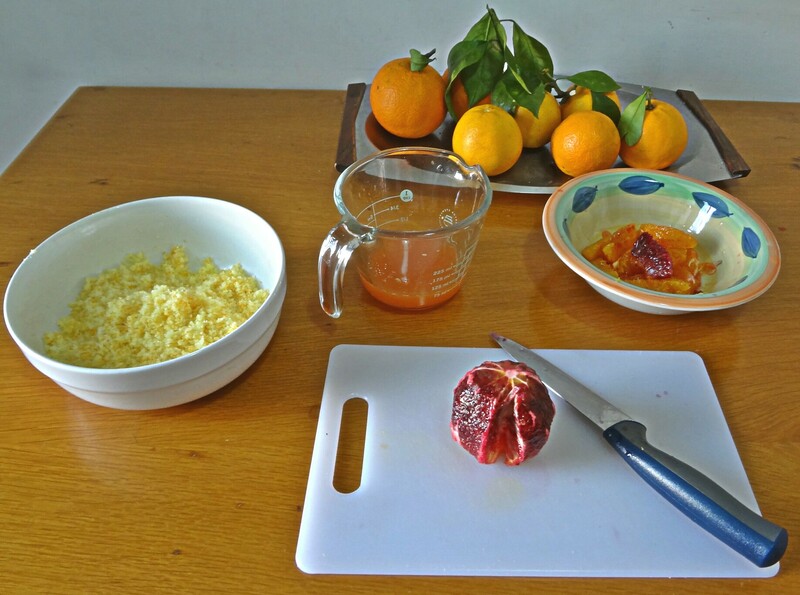 There were many recipes for making orange and olive oil cake but the one that appealed to me the most was one by Melissa Clark, perhaps because hers uses Blood oranges.The first stage of making the cake is to take the zest of 2 oranges and mix it with the sugar. What a wonderful aroma this produces, I could have eaten this citrus-infused sugar just by itself spoon by spoon. Then you have to ‘Supreme’ the oranges. I had never heard this term before, but it essentially means cutting a thin slice off the top and bottom of the orange, standing it up on a cutting board and then thinly slicing off the rind and pith so that the flesh is exposed. It is easier to separate the flesh this way which is a time-consuming task never mind what way one does it! 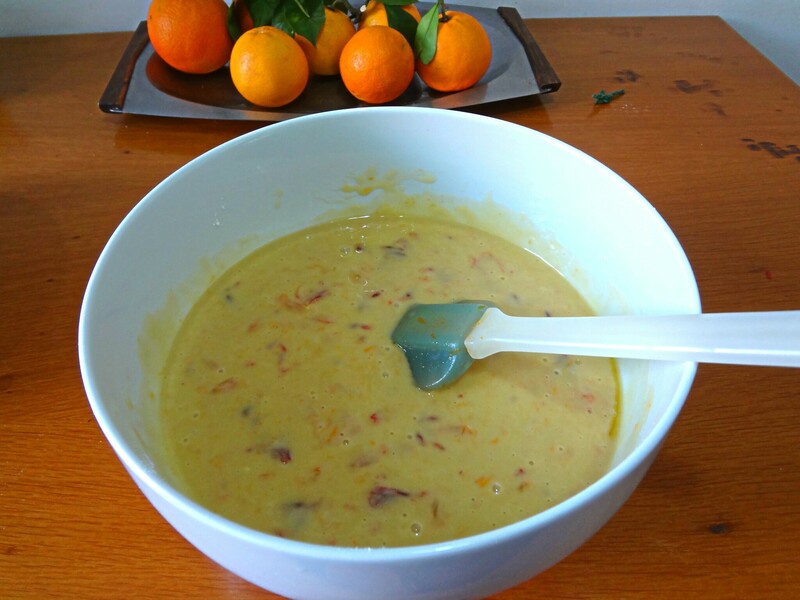 Then you mix the juice of 1 orange with yogurt or buttermilk, pour this into the sugar and whisk, add 3 eggs and whisk to mix and then stir this mixture into the dry ingredients. Olive oil is added in small quantities and finally the cut orange segments are folded in. The mixture resembles a thick batter at this stage and looking at it, I was nervous that it would end up as a dense thick pancake but it baked perfectly even in our ancient oven which has no markings for temperature and requires some guesswork. The cake was delicious, not too sweet, fragrant, and biting into the orange segments gave off a burst of bitter-sweet citrus in your mouth. As soon as it cooled, we had a piece with afternoon tea and everytime I go into the kitchen, I notice that Fidz has shaved off another slice! Remove the zest from 2 oranges and mix well with the sugar. Then remove the flesh and cut into 1/4 inch segments. 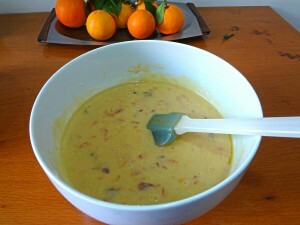 Squeeze the juice from the third orange and add yogurt/buttermilk to make 2/3 of a cup. Pour into the bowl with the sugar and whisk, add 3 eggs and whisk to mix well. In another bowl, mix all the dry ingredients. Pour in the wet mixture and stir until well mixed. Add the olive oil, a little at a time, and continue mixing. Finally fold in the orange segments, pour into a buttered cake tin and bake at 180C (350F) for 55 minutes or until a skewer poked into the middle of the cake comes out clean. The original recipe called for a 9 X 5″ loaf tin but I used a 9″ round and it was just fine. Thanks Joyce, I am going to try this cake recipe. I like to bake now and then. Keep well my dear friend.